But the British engine was no copy of the German one, for the man in charge of its reshaping was one Frank Hadfield Arnott - the chap who had virtually originated the scheme 44 years earlier in 1910. In pre-war days, the Arnott's father and son combination were names to be reckoned with in the motorcycling sphere. When motorcycling was in its infancy here in 1902, they had built the Princeps machines at Northampton. E. H. Arnott was associated with Werners too. Brother Frank - an inventive type - was additionally a dab hand as a sporting rider. In the search for more speed and greater reliability, he experimented with the then revolutionary idea of dispensing with the valve springs on a Triumph engine (the only unit of its day ideal for the purpose of conversion), contriving the opening and closing of each valve instead by a patented "push-pull" rocker controlled by a face-cam. Results were promising, but youthful exuberance being what it was, an overdose of throttle resulted in a wrecked engine. And the "powers-that-be" at Coventry, regarding their mutilated motor, promptly and firmly refused the loan of another. Shortly after, Frank Arnott turned his interests to four wheels, and thence to carburettors and superchargers, and the "push-pull" valve gear was forgotten. The years passed, and after the second World war, there came an interest in racing cars powered by 500cc engines - motorcycle engines. Frank Arnott, now chief of a big London manufacturing concern, took notice. And he remembered an idea he had four decades before. This time, the engine used was a 500cc J.A.P single. An overhead camshaft drive, by chain, was manufactured and a camshaft with Vernier adjustment was located in a housing atop the cylinder head. 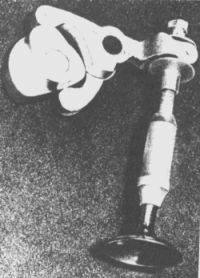 Bifurcated rockers - with one leg offset, and with a yoke instead of a tappet on the valve arm - were made up, and the valve provided with adjustable collars. Four cams - one to open and one to close each valve - were mounted on the shaft, and the collars adjusted until the valves could still turn on their seats without up and down play. And the result ? An o.h.c. 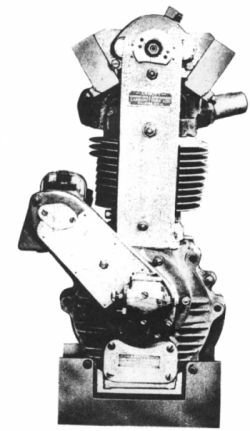 engine in which valve bounce was impossible and in which the ability of the valves to follow the cam contours was no longer the limiting factor in its "breathing", plus enhanced reliability, since stresses are reduced. Arnott Garages Ltd performed a limited number of these conversions to private owner's existing engines at a price of £�90. The conversion consisted of the provision of the new valve gear together with the cam box. On the Arnott engine, the existing crankcase and timing chest parts had been modified to take the camshaft drive. However, a completely new crankcase was also planned for the conversion. Finally, the existing J.A.P head had an additional spark plug position. [Arnotts Garages (Harlesden), Ltd.] Makers of Arnott racing and sports cars. Chairman: F. H. Arnott. Managing Director: Miss D. M. Arnott. Directors: E. F. Arnott; A. J. Frampton; B. J. Peebles. General Manager: G. R. Thornton. Company Secretary: D. M. Arnott. Head Office: Palermo Road, Harlesden, London, N.W.10. T: Edgware 0046. Works: Whitchurch Lane, Edgware, Middx.